Doug MacLeod sent in these pictures showing his scratchbuilt model of the LR&HS locomotive “James Wyman” towards the end of its construction. The prototype was built by Baldwin in 1892 for the Laurel River & Hot Springs based in North Carolina. It was sold to the Wiscasset & Quebec line (a fore-runner of the WW&FR) in 1893-4, but was not delivered for financial reasons. Instead it was sent to the Sandy River Railroad as their second #3 and renamed “Old Star”. In 1908 it was transferred to the SR&RL as their #16, and was later re-built as a 2-6-2. In 2008, I posted a set of questions to the MaineOn2 Yahoo! group list under this title. I felt that the Yahoo! group postings had been dominated by other topics such as ”bashing brass and brass owners” in the verbal/written sense not the converting to another type sense, and by complaints about the poor running qualities of particular examples of brass loco’s, and that it was time to encourage other brass loco owners who had been quietly enjoying positive experiences with their collection of loco’s to post about them. The questions were chosen quite deliberately to allow different locomotives to be selected, recognising that some owners may have a favourite loco which they would not necessarily recommend as a suitable choice for a newcomer. My thanks to all the contributors for their comments and especially to Bill Kerr for updating his replies showing how they have changed over a three year period, and for the “Pearls of Wisdom” from a former Moderator of the Yahoo! Group and long term On2 modeller about starting today. The collected views have been re-edited in 2013 to present a consistent loco/model naming format to facilitate links etc, and finally posted to the new style FAQ’s site. What locomotive would you suggest to an interested newcomer (who is supposed to be fully aware of the pitfalls of brass loco’s, but nevertheless has decided to model in On2) as a first purchase and why? Terry Smith: Probably a Custom Brass SR&RL #6, because they are a good general engine, and when re-motored (a number are already) can be very reliable performers. Bill Kerr (2008): Custom Brass SR&RL #6 , basic engine, not too complicated, good starter if it needs rework, not too costly, the Forney’s probably defined the two footers, more then the 2-6-0 or 2-6-2 (which I prefer). Bill Kerr (2011): If serious about On2, start with Custom Brass #6, its small, still seems to be relatively easy to acquire one, and easy to start your journey on working with On2 brass. See also the general comments. Jerry Kitts: I will stick with the No. 23. Some of the smaller engines would frustrate a new comer to On2 right to another scale or track gauge. Brass Locomotives have pitfalls? All models that move under their own power can have problems. I would suggest the No. 23 because it runs well, it’s easy to work on, plenty of room to add sound and/or DCC without losing your mind trying to stuff all that electronics in a Forney should it be your first time around. I would certainly recommend a brass steam engine over some of the new stuff coming in from say Bachmann, which may be cheap, but you really get what you pay for. I have some Bachmann engines most of which have failed when you actually run them with a heavy train. Bachmann has replaced the parts, on two of them twice and now one of them has failed just sitting on the shelf. I tried their version of a Forney and sent it back. The drivers were not even round and as to turning into a scale model not much chance of that happening if you are interested in Maine Two Footers. The out of round drivers gave me a good excuse to get my money back. 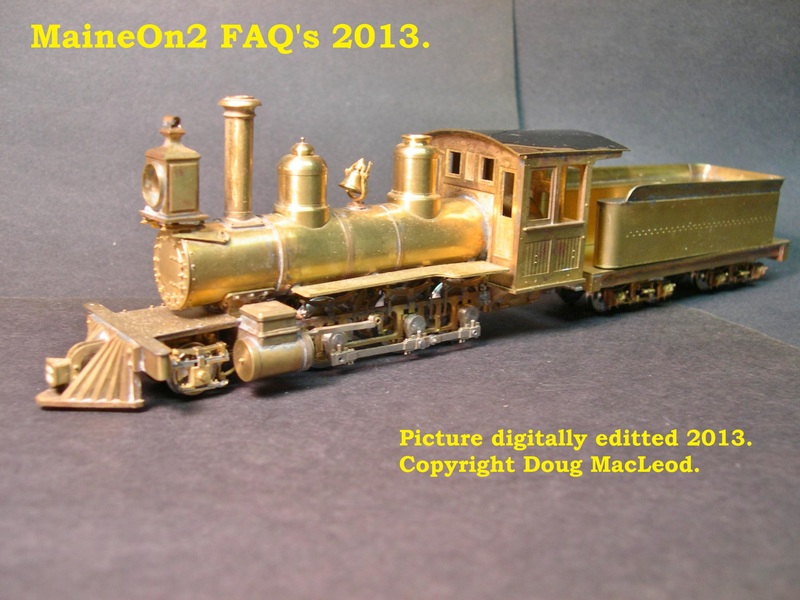 So far if you want to be in On2 I am not aware of any offering that is not brass for a locomotive. Trevor Marshall: I’m quite pleased with the performance of my Car Works B&SR #6. It is relatively new and needed little done to it. I added a pair of wipers to the drivers on the insulated side and it picks up power well and runs very nicely. Locomotives from this run (SR&RL 8 and 9, WW&F #7, B&SR #6) are still available “new” so haven’t suffered from being much loved, as have some of the older engines that I purchased second hand. For someone who’s looking for a first On2 brass engine, I think there’s a lot to be said for getting one that’s new. Chester Louis: I would ask the newcomer what their plans were and then suggest. If they are interested in big power I’d suggest Custom Brass SR&RL #24 or Custom Brass SR&RL #16. If they wanted something simple, then it would be Custom Brass SR&RL #6. They keep popping up on eBay. Jace Kahn: The last is a thorny matter, as most On2 modellers are prototype-specific, and a great deal depends on the individual modeller’s preferences. As a general thing, probably a Portland Forney remains the obvious choice for a first locomotive, both for size and because, effectively, all the Maine two-footers had them; the SR&RL Prairies (and even WW&F #6) are large to start with. If someone were thinking of producing a new locomotive in On2, I think one of the Porter 0-4-4T’s would be worth doing (I’d buy one)–they are small and basic, and no else has ever made one commercially (I’m not sure whether anyone has even scratch built one). The other suggestion is one of the Monson Vulcans, which have the advantage of also being small, uncomplicated, and the prototypes are still in existence, and (periodically) still in steam, so there is likely to be some additional interest among the general public. Bob Schlechter: The Custom Brass SR&RL #6, etc. Forney as it is the most versatile of the prototypes as it was produced in the greatest numbers model wise and can depict many roads if not free lancing. Also, the Forney is the watermark of loco types for the Two Footers. Gerry Cole: The Custom Brass SR&RL #6 seems to be often available, or at least quite a few were on eBay a year or so ago. Availability at a decent price would be the main advantage, and it’s already On2! Dean Brown: Get one that you like the looks of. This is a personal choice, but chances are you will spend a lot of time with that loco, so make sure you like to look at it. Also make sure you get one that runs well, or that you have the wherewithal to make it run well. Matt Coleman: Any of the old CB or CW locos would be a great start. Avoid the Putnam and Stowe locos — they are too much work. Matthew Latham: Hard to say as I only have one brass locomotive. What is your favourite locomotive? and why? Terry Smith: my Car Works Wiscasset #7, because it looks so good. Bill Kerr (2011): Prairie #24, I like its size, #23 is large in comparison, mine needs to be worked on to get it running, and it is a Baldwin that would look good running on any world wide railway, S American, Cuban etc. Jerry Kitts: My favourite is the Car Works SR&RL #23 because of how well it runs and it will take 30″ radius curves easily. If with little or no work a steam engine works great, then I am more than willing to put hours into detailing it to the best of my ability. Trevor Marshall: Until recently, a Car Works B&H #8. It was my first Forney – it has also been tuned and has extra wipers for pick-up so it runs quite reliably. It’s been used a LOT in my slate quarry – has been my “test loco” and has seen the most time in steam for operating sessions. My NEW favourite is a Custom Brass SR&RL #21. Just got it back from a tune-up and it’s delightful. I need to finish detailing it – it needs lettering, a crew, 14 panes of glass, a coal load, some shovels’n’picks, and weathering – but when it’s done it’ll be a much more appropriate locomotive for quarry work than the 2-4-4Ts. Chester Louis: It’ll be the Hinkley most likely, but will have to wait and see how the rebuilding of my Portland goes. Jace Kahn: Probably my scratch-built B&SR #7 (for obvious reasons, although I also like the prototype). Among commercial products, probably my Custom Brass SR&RL #24, because the lines of the prototype are so elegant. Bob Schlechter: From the stand point of aesthetics, the Custom Brass SR&RL #24 wins hands down in my thinking. The pinnacle of the BLW’s designs. 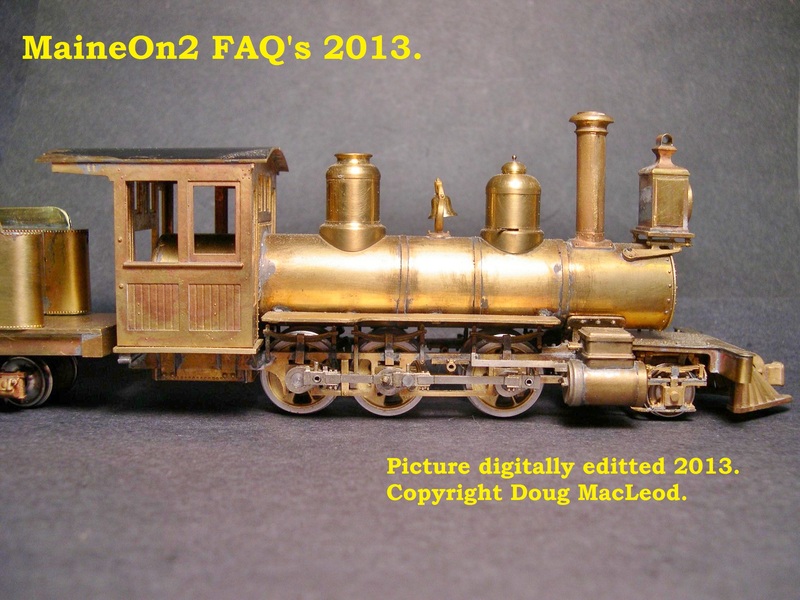 Gerry Cole: Definitely my brass Car Works SR&RL #23. I think #23 is even prettier than the more popular #24, and both have room for DCC and sound. Dean Brown: This is a toss up between the Car Works SR&RL #10 and the Custom Brass SR&RL #24. The big Forney, emblematic of Maine 2-footers, looks good and runs well, while I really like the proportions of the Prairie. Matt Coleman: Custom Brass #22. It looks great and runs well and I just happen to like those big Forneys. Matthew Latham: Car Works WW&F #7 because it is the only WW&F locomotive I have. Doug MacLeod: SandyRiver 2nd #2. Probably will be the next On2 locomotive I build. What is your best locomotive? and why? Terry Smith: A Portland Products F&M Forney, because it is so reliable. Bill Kerr (2008): Car Works SR&RL #23, currently being reworked and sound added. Jerry Kitts: Car Works SR&RL #23. Because it runs better than any other brass locomotive I own. It came with a few faults, like some parts ACC’d on the frame, but following some clean up and quality time with my torch all the parts are now soldered in place. Trevor Marshall: Custom Brass SR&RL #24 – it has been tuned and is a very smooth runner. Chester Louis: It will be my Hinkley when it is finished. Because I built it. Jace Kahn: Do you mean best runner? or most suitable? or best-detailed? Hard to say, although I could cite a couple of lemons. Bob Schlechter: Again, the Forney (the Custom Brass SR&RL #6) as it was used on several of the roads making it versatile. The Custom Brass SR&RL #24 and the Eustis engines (Custom Brass SR&RL 20, 21 & 22) are a close second. Gerry Cole: Not brass, but nonetheless the Bachmann On30 inside frame SR&RL. Purchased to run well when converted (hopefully by somebody else on this list) to proper On2. They seem to be economical, good running locomotives, very practical, but not the right gauge. If I can’t get it converted to On2, I’ll probably be able to sell it for about what I paid for it on eBay. Dean Brown: I’m not sure of the criteria here, but the Car Works SR&RL #10 is good in many respects, so it may be “best”. Matt Coleman: The Portland Products SR&RL #1 produced by Bob Werner/Hobby Barn Portland. Looks great, is small and runs very well. Matthew Latham: Car Works WW&F #7 as it is my only one. Doug MacLeod: Laurel River & Hot Springs, 2-6-0. Nice looking locomotive. John Rogers: My best running loco is a Custom Brass SR&RL #18 with a coreless motor and gear head and Grandt Line 2 to 1 bevel gear on the axle. It runs like a Swiss watch and I have bought motors and gears to redo several of them. What was your first locomotive purchased? When and why? Terry Smith: A Custom Brass SR&RL #18, purchased at the Edaville Rail Fan Fair in 1988, because it was the first On2 loco I had come across in the price range that I was willing to pay. Trevor Marshall: Custom Brass SR&RL #24. Purchased in 2003. I was interested in the scale/gauge potential and one was available. Chester Louis: My first was a Custom Brass SR&RL #24. I bought it at the 10th anniversary NG Convention in St. Louis from Peter Barney. Jace Kahn: A Custom Brass SR&RL #6, bought new circa 1978, because it was the only On2 commercial locomotive produced at that point. I have had three or four of them pass through my hands over the years, and that particular one has long since gone back into general circulation, but I have kept one #6, bought from the late Mike Pearsall (with can motor replacement), who had added a few details, and I have added a few more. Bob Schlechter: The Custom Brass SR&RL #6 Forney, etc. as it was the first and only one available at the time. Gerry Cole: Custom Brass SR&RL #6 “early”, purchased a couple years ago from a fellow Maine On2 list member. Why? Because the price was right, and I liked the size and proportions of the locomotive. Dean Brown: Custom Brass SR&RL #18, sometime in the late ’80’s. It was the first On2 loco I’d seen, it was painted and lettered and ran beautifully; it still does. Matt Coleman: my first loco was the Custom Brass SR&RL #16 2-6-2 purchased in 1984 or 85. Matthew Latham: The Car Works WW&F #7 Late in 2007 because it was the only WW&F brass locomotive available. 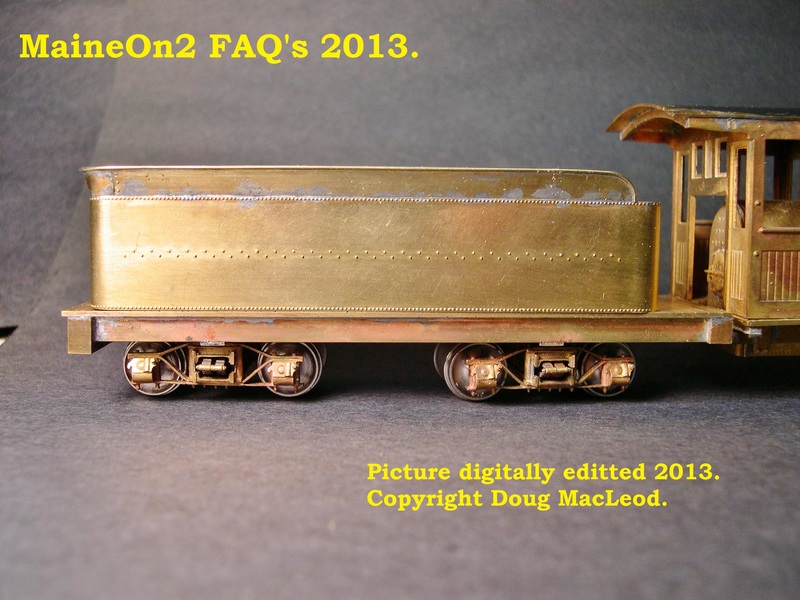 Doug MacLeod: Never have purchased an On2 locomotive. I have 3 On2 locomotives, built two and acquired Sandy River #1 for payment of parts from Putnam & Stowe. John Rogers: My first loco was not brass. I was probably “loco” at the time and bought a Bachman Forney. A good runner, but the wrong gauge. I narrowed the gauge. Not easy but do-able.